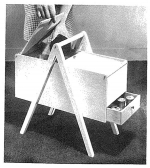 The plan says: The compactness of this unique cabinet recommends it to every woman who takes pride in keeping sewing accessories at her finger tips. Hinged lids cover a top compartment large enough to hold a variety of sewing needs. The full length drawer pulls out either way without spilling contents. The height is convenient to ones lap. Wood and/or Supplies needed: A piece of 1/4 inch plywood, 30 x 48 inches. I built this sewing cabinet using your plans and it turned out really good. Wife loves it.